It is finished. The last challenge letter is ‘z’ and I am toasting it appropriately with my favorite Zinfandel. Zinfandel was not a wine that I appreciated until I found this one. The following is the blog post I wrote in February of 2011. I have found a zinfandel that I like and ’7 Deadly Zins’ is its name. A product of the Lodi region of California, and produced by Michael-David Winery, it derives its name from the seven vineyards that supply the grapes to produce it. This is the first zinfandel that I have tasted that wasn’t weak. Perhaps I’ve been trying the wrong vintages, but this one surprised me. My husband and I spent an evening swirling, sniffing, gargling and sipping the thick dark liquid that had body and clung to the side of the wine glass, in no obvious hurry to slide back into the mix. We picked up scents of plum, leather, black cherry and cola. The oak tannins lingered long enough to make it suitable for smoked meats, while its spicy, peppery bite wasn’t overwhelming. It makes a good sipping wine as well, very satisfying on its own. During warm weather we like to grill outdoors. We also use a smoker and are particularly fond of smoked beef brisket. And the wine of choice for our next barbecue will be 7 Deadly Zins. If you pick up a bottle, check out the poem on the back that was written by Kevin Phillips, one of the next generation of wine makers in the Phillips family. Quite enjoyable. But then, good wine is poetry in a glass, n’est pas? With barbecue season upon us, this is the perfect wine. And I think that I should definitely celebrate the completion of this challenge with a nice spicy jerk chicken, fresh vegetables, and a glass of this rich zinfandel. Cheers to you all for taking this journey with me. If you have noticed, I failed to reply to comments, though I read and enjoyed each one. Time is a factor in blogging as most of you will attest to. I chose to use the time to visit your sites and leave my comments there. I will back to normal with the next post, which will probably be a week or so in coming. A daily post is a challenge – not only to the writer but to the reader. I can’t thank you enough for your patience and kindness in cheering me on. Next Next post: What’s for Dinner? The Perfect Meal for the Kentucky Derby Weekend! Alpha to Omega. Drum rolls. Here’s to you, Renee. An inspired journey. Clearly forgot to press send on your X entry. Reminding you of Xanthippe, Socrates’ often misunderstood and unfairly maligned wife. And then, of course, there are those of us who like an ‘x’ in their child’s name. Correct me if I am wrong. Looking forward to “service resuming as normal”. And thank you for taking the time reading and commenting over at mine. I appreciate it. I’m going to try to find this wine – congrats.!!!!!! As well you should celebrate! Well done – I’ve enjoyed following along as you tackled this challenge. I’ve never thought about daily blogging being a challenge for the reader as well….that’s food for thought! Congratulations! I will be looking forward to what you have in store for us next. You DID IT! Congratulations, Renee. Well done. Great job…and bbq season…that has a nice ring to it! It has been fun to see your inspiration unfold and be surprised by so many thoughts. Well done! Your rock! Congrats on completing this challenge! Hey, great job with “Z!” I’ll have to check out this wine. I’ve seen the label before, and now I have to experience it. Oh if you want a chuckle I posted the pictures of (well some ) my book signing. I had a load of fun and yes I really did do a book signing. Some of these pictures are just funny. 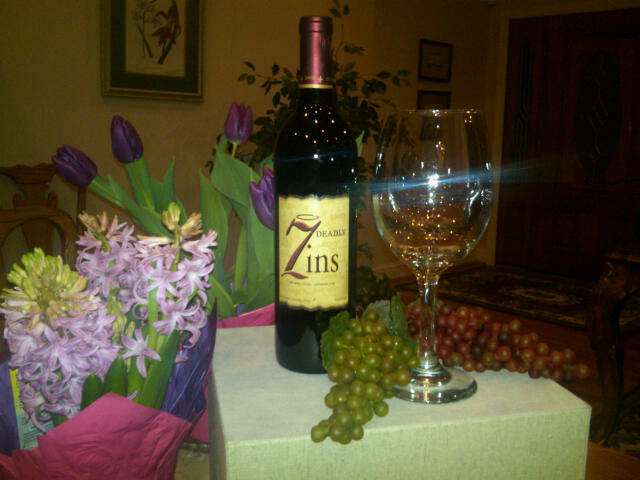 If 7 Deadly Zins is the only zinfandel you have tasted that was not weak, you have definitely not been trying good zins. Good zins are definitely not weak! Try ones from Seghesio, A Rafanelli, Hobo, Rosenbloom, Turley, Preston, Limerick Lane. These are all made from Sonoma County grapes, especially from Dry Creek Valley where zinfandel is king! You deserve a round of applause along with that zinfandel! Amazing set of posts! Congrats and cheers to a difficult task well done! Enjoyed them all. I’ve always been a Cab girl myself, with Silver Oak at the top of my list. I found a Zin last weekend that really impressed me. It’s called “The Prisoner” and it’s the best wine around. While not inexpensive at $38, it has made me it’s “prisoner” and I’ll be saving my pennies to have it again soon! Ya rocked it, Renee. Congrats! Congratulations! That particular wine is one of my most fav’s too! Great job, Renee, and what a great way to celebrate! Cheers! Congrats on finishing this inspiring project! I’ve had Seven Deadly Zins before and I agree, it is a nice wine. Way to end on a high note! Spicy jerk chicken with a glass of Zinfandel sounds like heaven. I am so impressed by what you came up with in this challenge. I know I would have been stumped along the way. Good on you! A big congrats to you Renee. Great job with this challenge.